CERTC is committed to providing the most efficient and dynamic training facility and experience on the Gulf Coast. Safety, Excellence,& Customer Service are our goals. LSU Certification testing is the 3rd Tuesday of the every month 6pm at CERTC. Remember to register with LSU FETI at least 7 days prior to test date and ensure you have a confirmation letter or email. 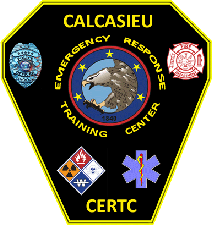 The Calcasieu Parish Emergency Response Training Center was established in 2000 to provide training to volunteer fire department in Calcasieu Parish. Since then, the facility has grown into a multi-use training center providing opportunities for volunteer fire, municipal fire, industrial emergency response teams and law enforcement tactical operations training. USAR, water and dive rescue recovery training is also conducted on site. Today we serve as the training center for 60 plus industrial emergency response teams and fire departments from across Louisiana and Texas. Construction on new training props is a continuous process. Expansion plans include additional USAR training props, industrial process units and additional confined space projects. CERTC can work with clients to provide specialized training and props to cover any emergency operation.